There is widespread coverage of yesterday’s Intelligence and Security Committee’s findings into last year’s terror attacks. The Guardian, Mirror, Metro, Mail and Independent lead on findings relating to investigations by MI5 on Manchester Arena bomber Salman Abedi before he committed the attack. 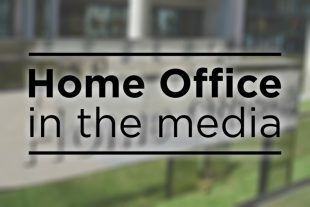 The Home Secretary's response to the report can be found below. My thoughts remain with the victims and families of last year’s attacks – which only served to strengthen our resolve against those who seek to threaten our freedoms and do us harm. Following the attacks, the Government, police and MI5 undertook a series of rigorous reviews to ensure we are all doing everything we can to tackle the evolving threat of terrorism. As a result, we have updated our counter-terrorism strategy, introduced new legislation to allow threats to be disrupted earlier and have increased information sharing with local authorities. We are also ensuring technology companies play their part by stopping terrorists from exploiting their platforms. I thank the ISC for their report which we will review and formally respond to in due course. The Guardian and Metro further report that fourteen suspected migrants were rescued yesterday from two dinghies off the Kent coast. There are claims people-traffickers are telling illegal migrants that crossing to Britain will become more difficult after Brexit. We have stepped up deployments of our coastal patrol vessels along the South-East coast in light of recent events. However, this is not an issue that can be resolved by maritime resources alone. That is why Immigration Enforcement and Border Force work closely with partners in the UK and overseas to strike people smuggling at source – identifying and dismantling the organised crime groups that facilitate illegal immigration. Nobody should put their life at risk attempting to smuggle themselves into the UK across the Channel and despite recent events, crossing the Channel in this way thankfully remains relatively rare. The Telegraph reports on Office for National Statistics (ONS) statistics released yesterday on domestic abuse. It says record numbers of men are reporting domestic abuse by their partners to police and the proportion of women victims reporting incidents to police has fallen. The Government response to the statistics can be found below. Domestic abuse is a devastating crime that shatters the lives of victims and families. It is vital that the response to domestic abuse supports victims and survivors, pursues perpetrators and ensures agencies provide an effective service. This Government will be publishing a landmark draft Domestic Abuse Bill, which will help transform our response to the crime. We will have pledged to create a statutory Government definition of domestic abuse, introduce new Domestic Abuse Protection Orders and establish a Domestic Abuse Commissioner. We would urge anyone who is the victim of this horrific crime to come forward and report their experiences, safe in the knowledge that the state and the justice system will do everything it can to both support them and their children, and pursue their abuser. It is encouraging that more people are requesting information under the Domestic Violence Disclosure Scheme and the Government will be doing more to raise awareness of this. The Financial Times and Mirror report on the Home Office’s Tier 1 visa review. The coverage notes that the review was a response to complaints that immigration rules originally intended to tackle serious criminals had been used to refuse over 1,500 highly-skilled workers and entrepreneurs the right to settle in the UK, often over minor tax issues. The Immigration Minister's response to the review can be found below. The review has found that the vast majority of cases, the discrepancies between the earnings declared to the Home Office and those shown by their tax records were over £10,000. It confirmed that it was reasonable for decision makers to take the approach they have, given these have not generally been cases of ‘minor tax errors’. We welcome skilled migrants who make an important contribution to the UK’s economy and society. However, it is important that people play by the rules.